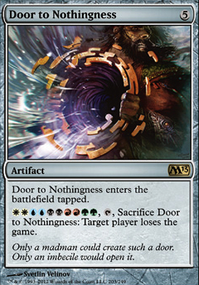 The only card that I see that I'd remove to put something else in if you have anything is the Mephitic Vapors. PauperPower, thank you! Your feedback is great for helping me brew the deck. I love Gurmag Angler, he was in this list when i started this. But I felt that Threshold and Delve doesn't work well together. But the Monarch is an interesting sugestion! I need draw with this kind of deck! Pulse of Murasa is another great card. The thing is, after testing, the deck takes some turns before starting to do something. In our LGS, there are RDW, Stompy and Burn. 6 Life is almost irrelevant. Gnaw to the bone gives twice that life easily! Mephitic Vapors is interesting. I didnt consider It, but now that you mention, I need to find a slot for It!! About Faerie, I need It to break Ghostly Flicker combos. I hate that card! Lol Edicts are there because of Bogles and Heroic (also in my LGS). Finally, I wanted to try Caterpillars Instead of Natural State because Im afraid of milling it accidentaly. And, Grapple with the Past helps me find Caterpillars If I need again. Thank you once again for your interest in helping me on my brew! I'll report my matches soon! 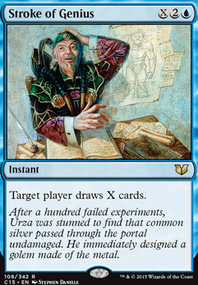 You can always throw in a few delve threats like Sultai Scavenger and Gurmag Angler. A copy of Thorn of the Black Rose could be great card draw for the deck. Maybe Pulse of Murasa instead of Gnaw? 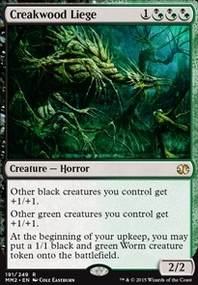 Gnaw could still be great in the sideboard though. Also maybe move the Edicts to the board and cut the Faeries, and just main board Bojuka Bog. Mephitic Vapors could be another great card for the board. I also just like Natural State over the caterpillars. Either way I think you're on to something here, +1! Overall a very solid deck, though you might want to consider replacing Feral Abomination with Tetzimoc, Primal Death, and Skittering Heartstopper with Isareth the Awakener. 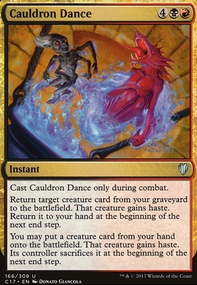 Tetzimoc, Primal Death, while legendary, is stronger, and it's ability in your hand can be useful against any non-control deck. Isareth the Awakener can help in the grindier games by allowing you to return other creatures that have already died. Also for grindier games, Find / Finality and Golgari Findbroker are worth consideration in the sideboard. Also Golden Demise/Mephitic Vapors/Ritual of Soot in the sideboard for tokens would be pretty good. As far as budget options, the Statue portion of Status / Statue takes care of most permanents. Cast Down/Walk the Plank will work pretty well against most decks, though Murder is a better creature catchall. 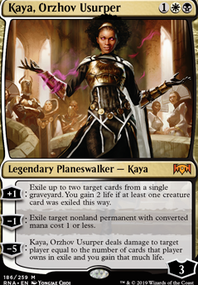 And maybe sideboard Plaguecrafter or The Eldest Reborn for planeswalkers. Golgari Guildgate and Foul Orchard can replace Woodland Cemetery and Overgrown Tomb, but then your deck won't be very competitive. I started out with 26 lands, but i lowered it cause i wanna get them out of the way faster so when i exile Enhanced Surveillance the deck is that much stronger.the lowered landbase is also why Syncopate doesnt work in this build. Waiting for a land past the 4 mana mark is fine, since discard spells tend to he cheaper on mana than counter spells are. Im willing to go to 24 though. Will think on that one. I was thinking the same thing about creatures sticking. My answers for creatures only start at turn 4 or 5. Etrata, the Silencer, Phyrexian Scriptures, Discovery / Dispersal, Dream Eater. Been thinking Cast Down, but i really like the Dead Weight idea too. Also been looking at Mephitic Vapors, as it also surveils while dealing with tiny creatures. Pilfering Imp is the only card that does what i want it to do other than Thought Erasure. And i really need to ensure that play on turn 2. I play it as a chump blocker during the rest of the game for the most part. As an opening play i dont think it takes effort at all. There is nothing else i can play turn 1, so its not like it takes more mana than it should. The sideboard is a bit wonky right now, so its all up for change.ill add another copy.